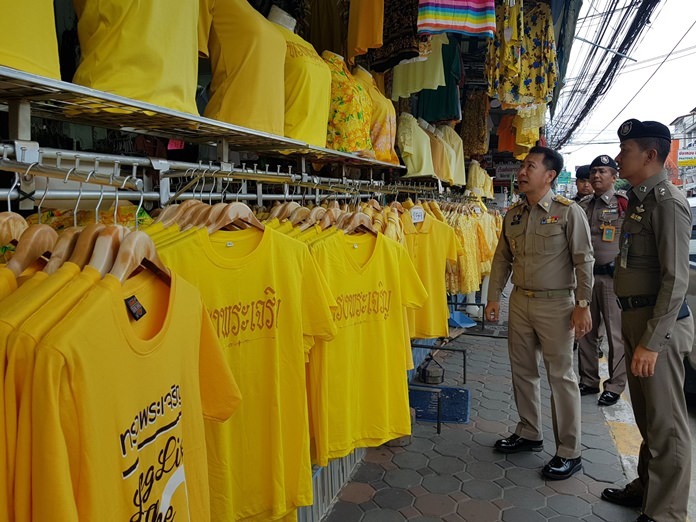 District Chief Naris Niramaiwong leads a check of clothes stores to make sure yellow shirts sold this month for HM the King’s birthday meet proper standards. Banglamung authorities have begun inspecting clothing shops to ensure that yellow shirts sold this month for HM the King’s birthday meet proper standards. The government has encouraged both Thais and tourists to wear yellow this month in honor of the King’s July 28 birthday. But those shirts must only have approved logos and slogans. District Chief Naris Niramaiwong led a June 25 check of clothes stores, looking for shirts that, for example, carried replicas of the King’s signature, which is prohibited, or images that violate a copyright. 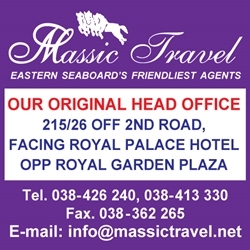 Unauthorized symbols or letters are disrespectful and considered inappropriate, Naris said. However, slogans like “Long Live the King”, and polo shirts with images of the King are allowed.